Fresh Relevance announces a new feature: Price Drop Targeting. Ideal for generating more proactive customer engagement whilst encouraging them to purchase. The aim of marketing is to get customers engaged with your brand which will result in sales. 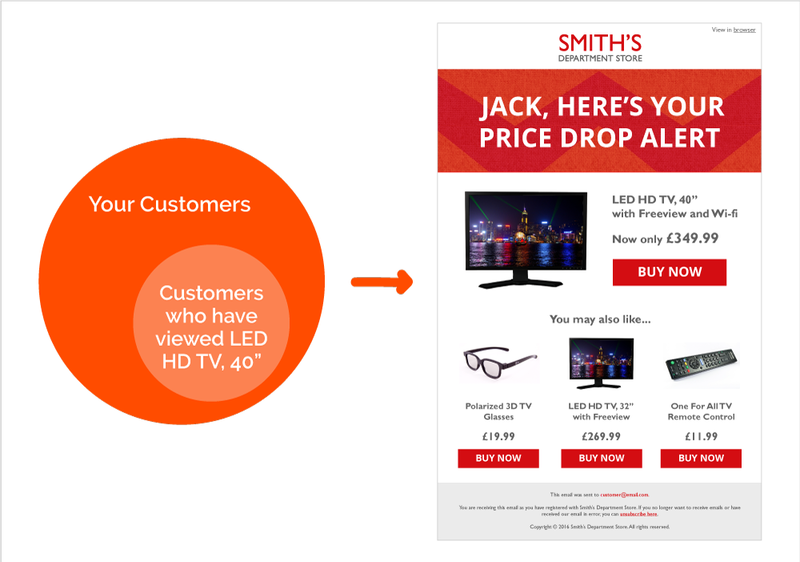 The Fresh Relevance Price Drop Targeting email feature enables messages to be sent to shoppers, informing them when the price of products they have browsed have been lowered. The Price Drop Emails feature allows emails to be sent to shoppers that have browsed products that have subsequently been reduced in price. Fresh Relevance not only identifies the shoppers who have browsed price drop products but also allows details (including images) of these products to be automatically inserted into your Bulk Emails or Browse and Cart Abandonment Emails so that it is relevant for each individual shopper. Add value to your marketing with data capturing! In addition to the ability of Fresh Relevance automatically identifying all shoppers who have browsed products that drop in price, this scenario can also be leveraged to increase list size, the audience and browser identification. This new Price Drop feature is ideal for promoting sale items, or clearing excess stock that is being sold at a lower price. By targeting people who have previously looked at the product, but haven’t made a purchase, you can promote the improved value to a highly targeted segment of your shoppers. It creates a segment of customers and targets them with products which are now better value than before, with no manual configuration from the marketer. Once it’s setup, it just becomes a money machine, driving prospective purchasers to your offers. The feature allows the marketer to have full control of the look and feel as all emails are sent via the client’s own ESP.